Your baby's favorite pastime is splashing in the tub and you're always on the lookout for potential new mom friends, so signing up for baby swim class seemed like a no brainer. But that weekly, 20-minute lesson may wind up being more than you bargained for. Here's are the seven stages of going to baby swim class. Since you don't need to pack sunscreen, sand toys, an umbrella or a cooler, you'd think that getting ready for swim class would be a breeze. But whether it's a bag to hold your wet suits after class, a towel for yourself, flip flops to avoid locker room germs or a diaper for after class, you always seem to forget something. They may look angelic once they're in their swimsuit, but dressing a baby for swim class is like dealing with the devil. Every surface in the locker room is rock hard, tiled and wet, leaving you just one slip and fall away from a visit to the emergency room. You're so sweaty from all the getting dressed aerobics that a dip in the pool sounds pretty great. But first it's time to stand around and wait for class to begin with the other new moms. You make small talk about names, ages and who's baby is sleeping through the night, all while trying (and failing) not to compare your post-baby body to theirs. Even though they've been trying to wiggle out of your arms and over to the deep end, now that it's actually time to get into the water your kid wants nothing to do with it. Trying to climb down a ladder with a squirming baby is hard enough without them acting like the pool is filled with acid instead of water. Turns out baby swim class is basically sing-along time at the library, but in water. Just as you start to wonder why you're paying a small fortune to sing The Wheels on the Bus while wet, your child will start kicking their legs and smiling. You know it's a long shot, but you can't help but wonder if you're holding the next Michael Phelps. Almost as soon as it starts, swim class is over, and it's time to reverse the treacherous journey into the pool and climb out into the frigid air to peel off your clammy suits. No matter how frustrating your child is while you're trying to get you both dried and dressed, you're very aware that there are other parents nearby, which means you have to be on your best behavior, even if your kid is not. As you toss the wet clothes into the trunk and strap your child into their car seat, you realize that getting dressed and undressed for class took longer than the actual swim lesson. 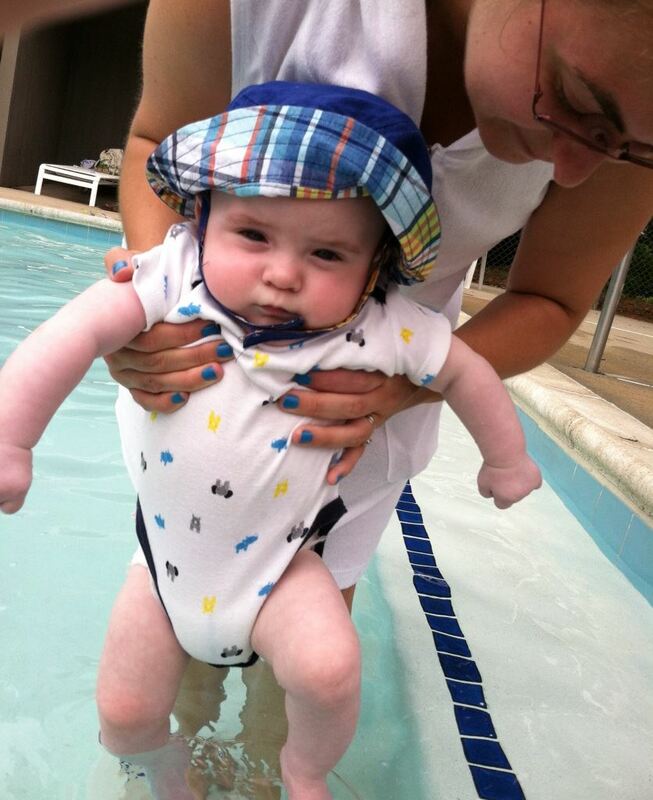 But you know you'll be back anyway, because the look on your baby's face while in the water makes the rest worth it. This piece was originally published by Megan Zander on Mommy Nearest. Megan Zander is a mom to twin three-year-olds who loves running and buttercream frosting in equal measure. Her work has appeared on SheKnows, Yahoo Parenting, Romper, The Stir, Scary Mommy and more.